The works of Pierre Lahaut (1931-2013) remain a privileged witness to the evolution of the Belgian artistic movements throughout the second half of the twentieth century. We associate them with different successive trends, such as symbolism, minimalism, new subjectivity and geometricization. Having twice won the prize for Jeune Peinture belge, Pierre Lahaut is also known for being a member of the group Jeunes Figuratifs belges and co-founder of the group Axe 59. He was involved in the academic world and was a well-known teacher, having taught for 17 years at the National School of Visual Arts of La Cambre (ENSAV) where he created the Atelier de dessin et stimulation graphique (Drawing and Graphic Design Studio). Through forty paintings, the exhibition at the Royal Museums of Fine Arts of Belgium focuses on the sixties, a pivotal point in time for the artist. The selection shows the shift Pierre Lahaut made to the non-figurative and lyrical movement in the face of geometric obedience. 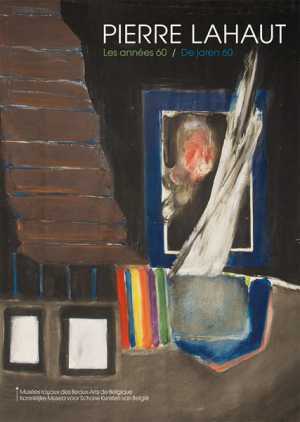 The same paintings and aquarelles were exhibited in the Centre for Fine Arts in Brussels in 1967. 50 years later, the Royal Museums of Fine Arts of Belgium invite you to rediscover these works, enriched by the addition of a technological component: the Digital Experience. To deepen this experience, a multimedia cylinder offers enhanced content - touchscreen table, videos, photos, archives, high definition projections, etc. - for a comprehensive approach to the life and works of Pierre Lahaut. With this innovative concept, the Royal Museums of Fine Arts of Belgium aim to constantly renew the experience of the public within the museum. Located at the heart of this space for a minimum of three years, this project will complement and improve each new selection from the collection of modern and contemporary art. This twenty-first number of the Cahiers of the Royal Museums of Fine Arts of Belgium was made for the exhibition Pierre Lahaut, The 60s organised by the Royal Museums of Fine Arts of Belgium in Brussels. The exhibition is under the high patronage of Princess Léa of Belgium. We also thank La SONUMA. Les archives audiovisuelles (www.sonuma.be). Closed: Monday and on the 1st of May. Free admission with a ticket for the permanent collection or for the temporary Rik Wouters exhibition.